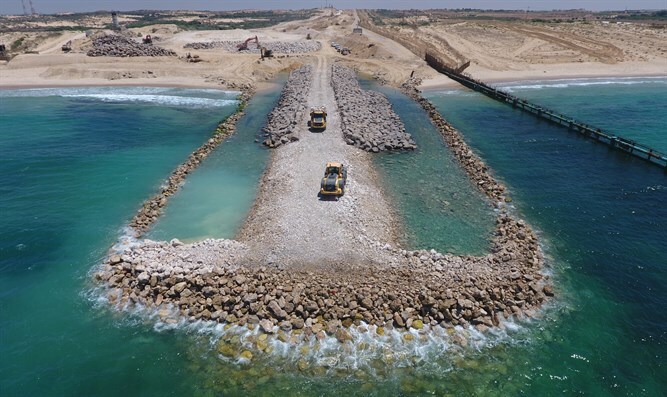 About two months after the start of work on the new sea barrier at Zikim Beach, north of Gaza, Israel's Ministry of Defense has published the first pictures of the site. The length of the barrier is 200 meters, the base width is 50 meters, and the fence is 6 meters high. Additional measures will be installed to provide full coverage of the entire sea against infiltration. The decision to erect an upgraded naval barrier was made as a result of lessons learned in the Protective Edge counterterror operation of 2014. The new response to the security threat was designed to withstand sea conditions and serve the defense establishment for many years. Defense Minister Avigdor Liberman (Yisrael Beytenu) said, "The work to construct a barrier - both land and sea - around Gaza is advancing at an efficient and impressive pace. With every day that passes, our abilities around Gaza grow stronger." "We will continue to protect the citizens of Israel, when we need strength and when we need wisdom."